Monday, September 30, 2013, 6:30 p.m.
To better understand light and optics, the young Isaac Newton once inserted a long needle "between my eye and the bone, as near to the backside of my eye as I could." Why would someone do that? Lucas Hnath's new play, Isaac's Eye, reimagines the contentious, plague-ravaged world Newton inhabited as it explores the ingenuity and ambition that drove the rural farm boy to become one of the greatest thinkers in modern science. Directed by Susanna Gellert. Featuring Kim Gilbert, Brad Koed, Bruce Nelson, and Gavin Witt. Followed by a post-show conversation with playwright Lucas Hnath. 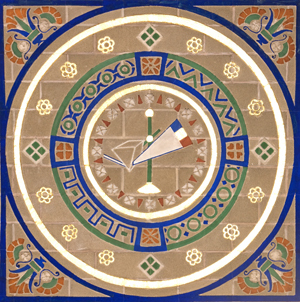 The image on the left is a detail from the Great Hall of the National Academy of Sciences. It is a representation of Newton's prism. A very young Isaac Newton turned a popular toy into a scientific instrument, transforming optics.